A total of 25 million tablets were shipped worldwide in the second quarter of 2012 as Apple's iPad increased its market share, accounting for 68 percent of all shipments. Apple's share of the worldwide tablet market was its highest level in almost two years, according to the latest research from Strategy Analytics released on Wednesday. Driven by the iPad, global tablet shipments grew 67 percent year over year in the second quarter. Apple announced on Tuesday that it sold 17 million iPads in the quarter, which represented an 84 percent increase from the same period a year prior. 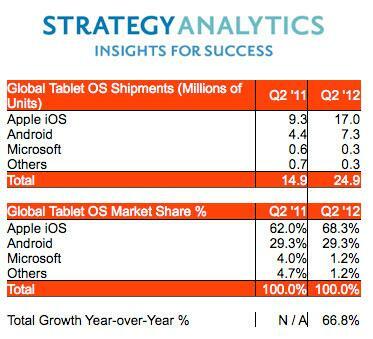 Total Android tablets during the same period were estimated at 7.3 million by Strategy Analytics. That gave Apple a 68.3 percent share of all tablets shipped worldwide, more than doubling Android's 29.3 percent share of shipped devices. Microsoft, which is banking on the launch of Windows 8 later this year to help it make a splash in the tablet space, held just 1.2 percent of the market. "Despite high expectations for companies like Amazon, Samsung, Acer and Asus, the Android community has yet to make a serious dent in Apples dominance of the tablet market," said Neil Mawston, executive director at Strategy Analytics. "Unspectacular hardware designs, limited uptake of cellular models and a modest number of tablet-optimized services have been among some of the main reasons for Androids mixed performance so far." Android's presence in the market is expected to grow with the launch of the Google Nexus 7, a newly launched 7-inch touchscreen tablet priced at $199, which is half what Apple charges for its entry-level $399 iPad 2. Microsoft will also make a big push against Apple's iPad this fall, when it releases its own tablet hardware, dubbed Surface, which will be based on low-power ARM processors like the iPad and Android tablets. The Microsoft Surface will run a special version of Windows 8 designed to operate with ARM CPUs.